CINCINNATI — An Over-the-Rhine food pantry is giving out meals ahead of the holiday. Over 1,000 volunteers will distribute meals from 8 a.m. to 6 p.m. Wednesday and Thursday at 112 East Liberty Street. 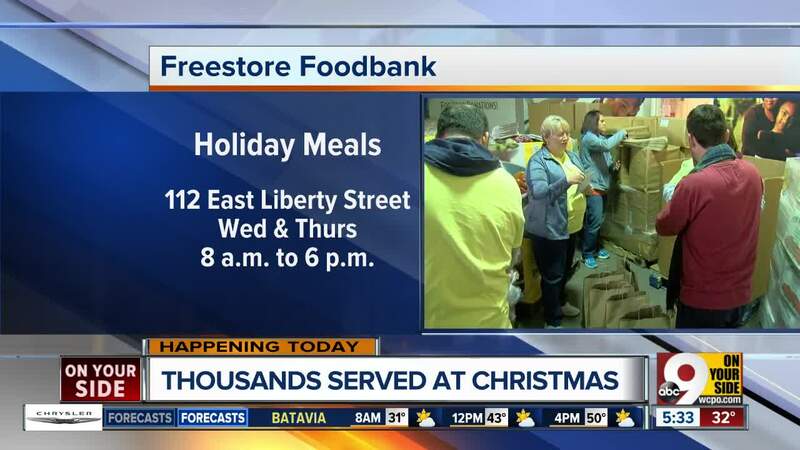 Freestore Foodbank served about 4,500 families last year, President and CEO Kurt Reiber said. Reiber said he anticipates the food pantry will serve a similar amount of people this year. Each household receives a turkey or chicken, one bag of produce, two cans of green beans, one can of carrots, two cans of corn, one box of stuffing, one box of macaroni and cheese and gravy. People picking up a meal box will need to show a photo ID and proof of residency.